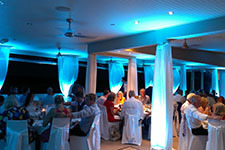 Sunshine Coast Djs uses only state of the art sound and lighting, and all equipment is commercial grade. 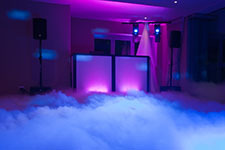 Our DJs use computerised midi playback systems, to ensure your dance floor doesn’t stop. This gives us the ability to search for your requests in seconds. 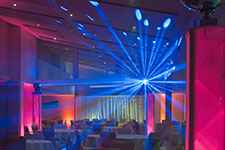 Our intelligent lighting effects & Moving Heads help create an exciting dance environment for guests without being overbearing. 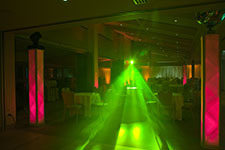 Our lighting is compact and non-obtrusive and the beams are positioned for maximum effect,creating a special atmosphere. 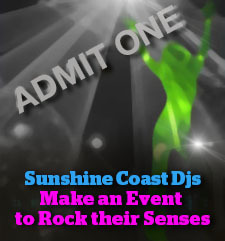 Sunshine Coast DJs has the ultimate in entertainment for every occasion and event. 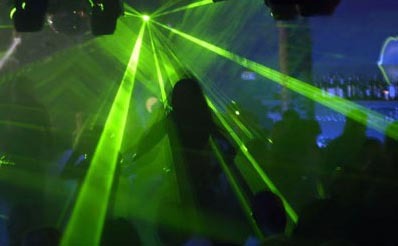 We are one of the few Queensland Mobile DJs that offer a digital video projection service, on a mobile basis. This gives you the opportunity to have all your favourite music videos projected on to the big screen, as well as the option of karaoke. Do you want to see your favourite artists perform at your party? Well, now you can. Let them make a big appearance on the big screen. Or for something extra special, have your very own slideshow on the big screen. Today’s data projectors are substantially brighter, offer greater resolution including full 1080p HD, and are becoming increasingly popular in widescreen format (16:9), as content slowly but surely moves away from the traditional 4:3 format. Sunshine Coast Djs only stocks industry standard brands such as NEC & Panasonic, including a growing range of zoom and short throw lenses for greater flexibility, regardless of venue.